Cafe Corner, the Victorian Village-Harrison West source of unusual sandwiches, has enlarged its menu considerably. One new winner is the puebla BLT, which combines the BLT with what Cafe Corner calls a “spicy espresso chili sauce” ($6.95). 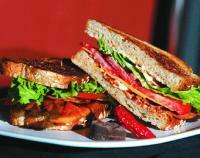 The result: a very savory, nutty-tasting and spicy version of a traditional bacon, lettuce and tomato sandwich. A lightly grainy nine-grain bread contains the ingredients.